Into a large pot (big enough to hold the chicken and 10 cups of water), add the water, the brown sugar, and the sea salt. Put the pot on medium high heat. Whisk until the salt and the sugar are dissolved. Immediately remove the pot from the heat. Immerse all of the chicken into the brining liquid. Add the garlic, the fresh ginger, the Serrano pepper, and the scallions to the pot. Wrap the top of the pot tightly with plastic wrap. Refrigerate the chicken overnight. About an hour before cooking, remove the chicken from the brining liquid. Pat the chicken dry with a paper towel. Combine the ground ginger, the onion powder, the garlic powder, the juice of 1/2 lime, the Sriracha chili sauce, the honey, the hoisin sauce, the soy sauce, and the sesame oil in a small pot. Put the pot on low heat. Whisk to combine all of the ingredients. Let the sauce cook on low heat for 10 minutes whisking occasionally. 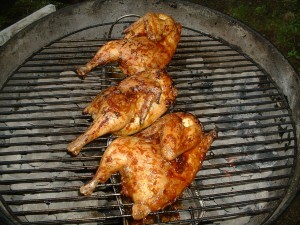 Cook the chicken on a gas or charcoal grill (skin side up) on low heat covered for an hour and a half. 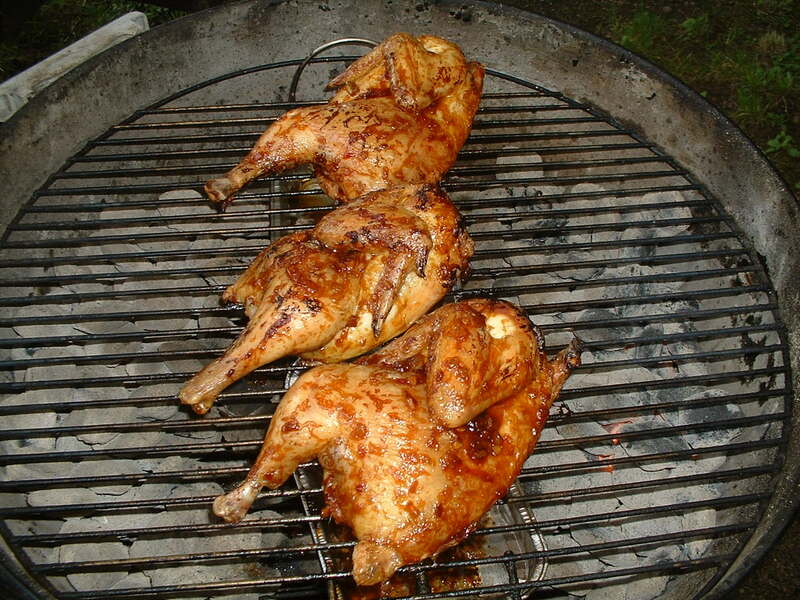 Brush the sauce on the chicken during the last ten minutes of cooking. For extra crispy skin, cook the chicken with the skin side directly over the heat source (gas or hot charcoal) for 2-3 minutes. Cut up the chicken and serve with any leftover sauce for dipping. Summer is tomato season. Take advantage of this wonderful bounty with this unique flavor combination of sweet, sour, and a little heat. The recipe is a different twist on the classic caprese salad that features fresh basil and mozzarella cheese. Preheat the oven to 250 degrees. Spread the walnuts out in a roasting pan. Roast the walnuts in the preheated oven for 10 minutes. Combine the mustard, the sherry vinegar, the parsley, the olive oil, ½ teaspoon of sea salt, and a pinch of black pepper in a mixing bowl. Whisk until well blended and thickened slightly. Taste and add more sea salt and/or black pepper, if desired. Spread the tomatoes out evenly on a plate. Sprinkle the tomatoes with sea salt and ground black pepper. Spoon the vinaigrette dressing out uniformly over the tomatoes. 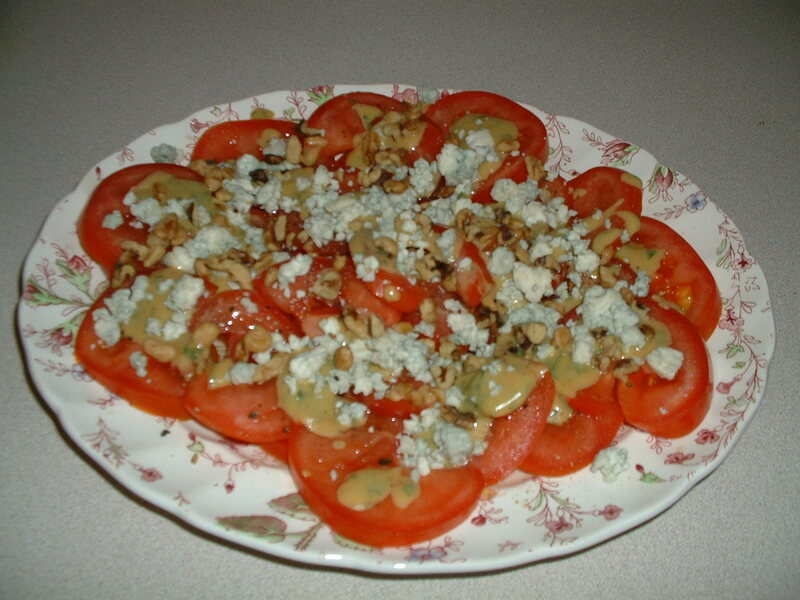 Top the tomatoes equally with the gorgonzola cheese and the roasted walnuts. Serve immediately.